Standard Platform Size: 36"x 60"
The AmeriGlide Hercules Toe Guard Commercial Vertical Lift has been specially designed to be the most versatile model available. It features a self-contained lift and stationary lower landing which combine to offer powerful and reliable performance without having to install a hoistway. For those struggling to find an accessibility solutions for existing sites that only offer limited space, this may be answer you have been looking for. 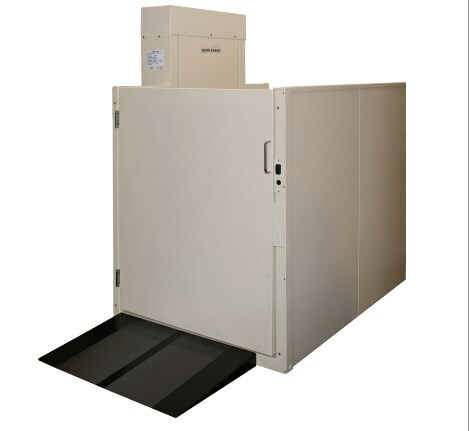 In addition to easy, hassle-free installation, the AmeriGlide Hercules Toe Guard Commercial Vertical Lift also provides a 750 pound weight capacity, powerful motor and braking system, spacious platform and user friendly constant pressure controls. The gate has also been designed for maximum safety and won’t open until you have arrived at your destination. You can make your building accessible to both visitors and employees for a low, affordable price. To learn more about this revolutionary new model and place your order, call today and speak with one of our experts.